As duke and high marquis of hell, Scox/Chax commands 30 legions. He appears as a stork with a raucous voice, and is known to be deceitful. He steals horses, and takes the silver in the houses he possesses only to return it 1200 years later if everything is still in order. If he is confined to a triangle, he will speak truth on supernatural matters, point out hidden treasures not guarded by evil spirits, and obey the exorcist. If he is not confined, he will lie and not always obey the exorcist. Shax, alias Scox, is a darke and a great marquesse, like unto a storke, with a hoarse and subtill voice: he dooth marvellouslie take awaie the sight, hearing and understanding of anie man, at the commandement of the conjuror: he taketh awaie monie out of everie kings house, and carrieth it backe after 1200. yeares, if he be commanded, he is a horssestealer, he is thought to be faithfull in all commandements: and although he promise to be obedient to the conjuror in all things; yet is he not so, he is a lier, except he be brought into a triangle, and there he speaketh divinelie, and telleth of things which are hidden, and not kept of wicked spirits, he promiseth good familiars, which are accepted if they be not deceivers, he hath thirtie legions. The Forty-fourth Spirit is Shax, or Shaz (or Shass). He is a Great Marquis and appeareth in the Form of a Stock-Dove, speaking with a voice hoarse, but yet subtle. His Office is to take away the Sight, Hearing, or Understanding of any Man or Woman at the command of the Exorcist; and to steal money out of the houses of Kings, and to carry it again in 1,200 years. If commanded he will fetch Horses at the request of the Exorcist, or any other thing. But he must first be commanded into a Triangle, or else he will deceive him, and tell him many Lies. He can discover all things that are Hidden, and not kept by Wicked Spirits. He giveth good Familiars, sometimes. 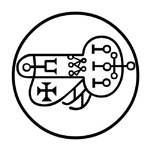 He governeth 30 Legions of Spirits, and his Seal is this, etc.